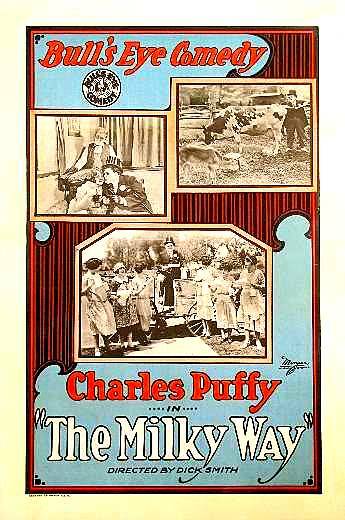 In 1917 Charles Puffy travels to the United States, where he had several screen tests were taken, and even got the leading role of a short movie. Rumors talk about multiple American made movies starring him around this time, but only a small, 5 minute movie is confirmed. His international movie career started in the United States. In 1922, he sails over to Hollywood for a short escape, where he shots a movie, but then he returns to Berlin for Georg Jacoby’s contract to play a major character role in a two piece series (Seine Exzellenz von Madagaskar – 1922). Going back and forth between Berlin and Hollywood remains a part of his life later on too, since these two cities were the movie capitals at that time. After shooting in Germany in 1923, he gets a contract in the United States, where he stays longer than originally expected, as the planned few months stay ends up lasting four years. 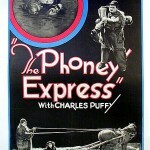 He starts shooting in Hollywood in 1924 again; his partner is Adolphe Menjou in his first movie. After this, he stars in numerous short movies as the leading actor. He does everything that a short comedy burlesque actor needs to do: riding horses as a cowboy and robbing banks. 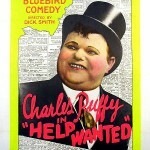 Nearly 25 Universal short films are made with Charles H. Puffy in the leading role, which makes him a well-known, cherished, and entertaining actor across the country. Although he slips a few times, he does not use stunts even in the most dangerous scenes. Spectacularly falling off a horse and laying on the ground, rolling down on stairs, pitching into mud, falling backwards, jumping from a moving train during multiple retakes – these actions look very amusing to the audience, but they involve great physical effort for an actor. Moreover, stunting is especially dangerous to do without previous acrobatic training. One scene is followed by another quickly and new shooting is on the way before he can catch his breath. He buys a house in Hollywood, drives a Cadillac, and dresses expensively with his inevitable accessory: the Cuban cigar. He hosts parties for Hungarians and he is known to be joyful and an optimist in his private life. Initially, even he may not understand the root of his success in the United States. We may think the answer could be the difference in cultural taste, and this could be true to an extent. But let us not forget that the burlesque is for common people. Considering the thousands of theaters that show movies in small towns, it is enough to have a few successful films in order for an actor to be known and followed by millions. This magnificent power is so new that moviemakers, film gurus and actors just started tasting it around this time. These were the first steps of celebrity cult – today its mechanism and effects are familiar to most of us, but at that time it was still new to the world. However, the stardom of Charles Puffy was anteceded by an interesting event – the shining and falling of Mr. Fatty. In 1924, the Fatty phenomenon is somewhat vanishing, but its absence in American movies is without a question. After Fatty vanished from the screen, many candidates attempted to fill the fat man role, but the task remained an unsuccessful endeavor. This was the time when Charles H. Puffy, the baby faced, kind, smiling, fallible figure emerged. Moreover, he resembled Fatty in his facial features, character, and acting, and what is more, he is almost the same age, so he gets to be the “good edition” of Fatty in a relatively short time. Millions, who were disappointed in the Arbuckle, shifted their admiration to Mr. Puffy, who was supported by Universal Studios. 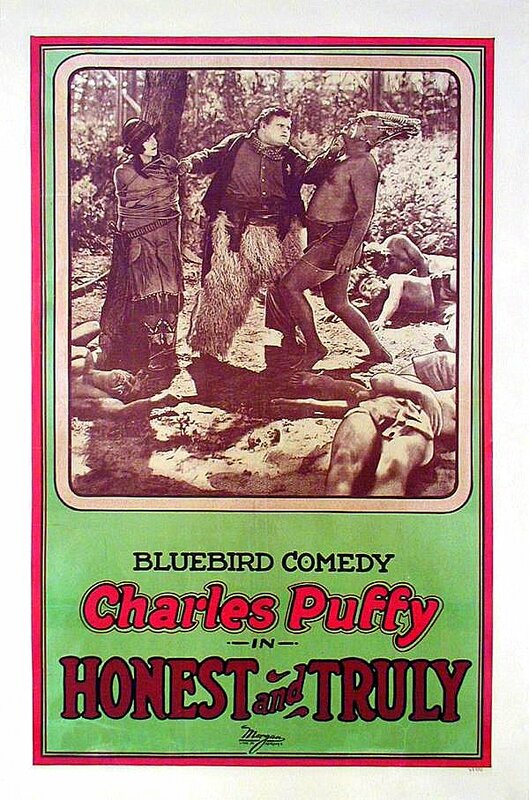 But let us not forget that Puffy is only one star on the crowded sky of the film industry. Larry Semon, as known as Zigoto, John Barrymore, Richard Barthelmess, John Boles, Ronald Coleman, Jackie Coogan, Stan Laurel and Olivier Hardy, Charlie Chaplin, Buster Keaton, Max Linder, Harold Llyod, Tom Mix, and the tragically destined male idol Rudolph Valentino all demand their portion headlines in the film section of newspapers and magazines, not to mention the arsenal of beautiful actresses. Therefore, the success of Puffy is comparative too; it would not be advised to under or overvalue it. He is a popular character of short comedies or burlesques, which are shown in a bunch among other movies across the country. 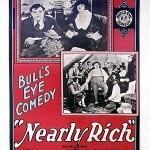 Several of his movies were produced and shown in the series “Bull’s Eye Comedy”, which also featured movies of other well know burlesque actors. This weekly of bimonthly series had to include a new Puffy movie every time. 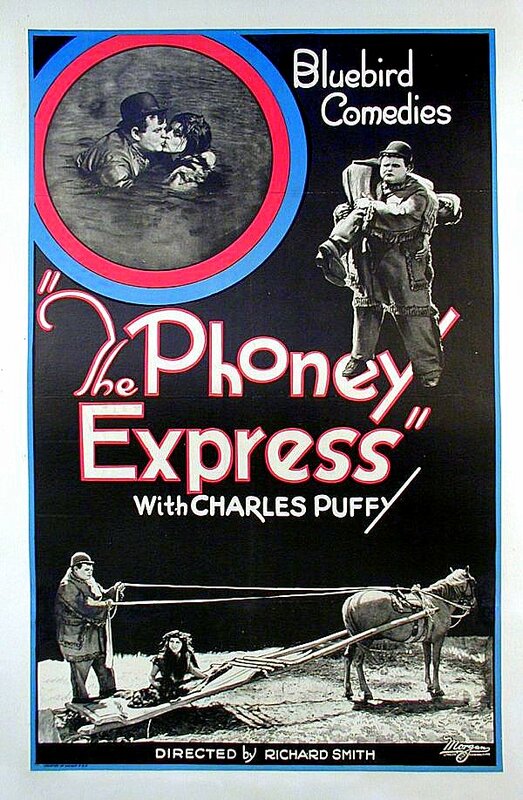 Puffy’s American movie success was on top in 1924-1927. This time period could be called Puffy’s golden era of burlesque. It is interesting that movie history also remembers him as an early legend of horror movies, especially because of his role in “Dr. Mabuse”. His partners in American movies include Raymond Griffith, Adolphe Menjou, Viola Dana, Helen Broderick, Conrad Veidt, Ricardo Cortez, Alice White, Betty Compson, Lon Chaney. Many times the leading actress in his movies is Elsie Tarron, who was discovered by Andy Clyd and was born as Elsie Maud Tarron in September 3, 1903 and who played character roles in silent movies along with Puffy. Later on Elsie led a retreated life in Los Angeles as movie and theater actor Andy Clyd’s wife until age 87. 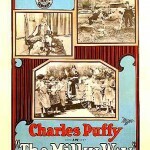 Puffy also had other returning colleagues in his movies, for instance Billy Engle and Mildred June. 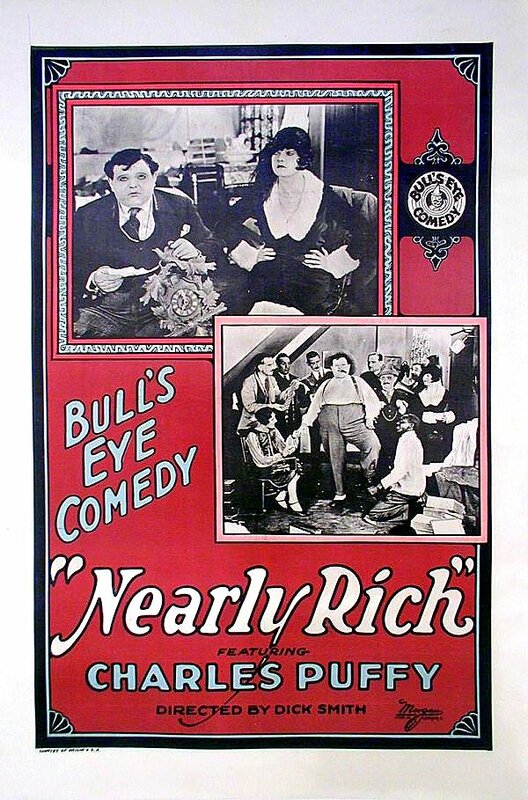 His screenplays are mostly written by Slim Summerville or Harry Sweet, while the “Bull’s Eye Comedy” movies were penned by Richard Smith, who later becomes the writer of other short comedies for Puffy. He is 135 kg and his height equals his weight. He is chubby, constantly laughing, while at the same time elegant and always has cigar in his mouth. He prefers – and more fluent -talking in Hungarian than in English. 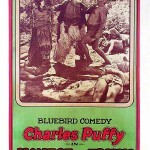 Puffy is among the first European actors appearing in Hollywood not long after the end of World War I. Many can see him as the precursor of the coming wave of Hungarian artists in Hollywood. As a foreigner European immigrant his way is filled with struggles until he can make a career in the world of American burlesque. However, his grotesque facial expression, body type, mischief gaze makes him popular with the audience. 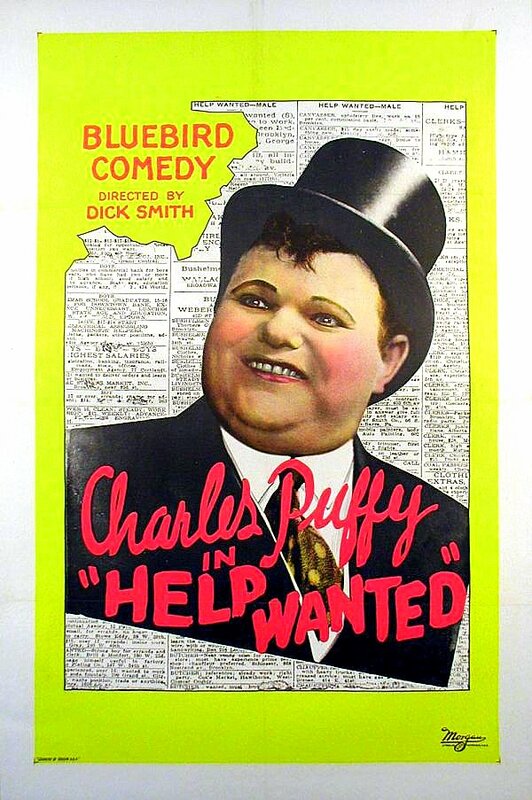 His pay increases and shortly he becomes one of successful silent movie stars in Hollywood. Even when he makes it in the movie business, and he has enough money to show off at parties, he does not get carried away. Money does not change him even when he has a lot. His wife cooks during get-togethers because Puffy does not tolerate American cuisine well. Even in Hollywood, the menu is bean goulash, stew with dumplings, fried chicken, potato paprikash, and of course crepes with apricot jam. As one of the first immigrant Hungarian actors, he started the tradition of hosting a Sunday brunch in his back yard of his Hollywood mansion, so every Hungarian who comes -whether they personally know him or not- can eat a good home cooked lunch. Furthermore, he manages to squeeze some money into the coat packet of those who a little too avidly stuff food into their mouth. The “victims” often do not realize that Puffy gave them a few dollars, and only found the donation later on while searching in their pocket for the bus fare, or found the warm hearting present upon arriving home. He donates to people, whenever he can, and never requires appreciation for it. Consequently, he does not like to talk about it. Rumor has it, several times Puffy looked at a complete loss at people coming back from the front yard thanking for the donation. He declines gratitude smilingly pointing upward that appreciation belongs to the church, not at his house. In the second half of his American period he is sometimes able to step out from his expected role and show his acting abilities in other movies, for example in the comedy of Sandor Korda’s „The Private Life of Helen of Troy” (1927). “Yellow Lily” is another Korda movie he can be seen in. Lastly, he plays a double role in an American-Italian speaking movie in Hollywood in the beginning of 1929. By the spring of 1929, he returns to Europe to shoot a Marlene Dietrich movie in Berlin.